Situated in the translucent blue-green waters of Peter the Great Bay in the Sea of Japan, Dalnevostochny Morskoy Zapovednik (or Far East Marine Nature Reserve) was the first reserve in Russia created to protect marine ecosystems. The underwater world of the reserve is rich in algae, invertebrates, cold and warm water species of fish, and marine mammals. Convergence of warm and cold ocean currents, mixing of air masses, and the complex relief of the shoreline and ocean floor create conditions for unrivalled plant and animal diversity. Above water, the many islands in the reserve are home to colonies of cormorants, black-tailed gulls, and rare Chinese egrets. Larga seals -- all but vanished in the Primorye Region -- breed on the islands protected shores. A diversity of plant communities extends inland from steep cliffs and rocky coastlines. Broadleaf and deciduous trees grow in tight, windswept clumps, intertwined with vines. Marshes, meadows, and brackish wetlands take over openings in the forest canopy. The recently restored visitors center on Popov Island and extensive system of tourist routes make the Dalnevostochny Morskoy Zapovednik a popular destination for nature lovers from neighboring Vladivostok and beyond. Rocky cliffs mark the northern border of the reserve. Rare stands of Japanese red pine line the coast of Tilyakovsky Cove. Black-tailed gulls form colonies on rocky cliffs and islands in the reserve. The setting sun outlines an island in Peter the Great Bay. Rocky coasts and islands abound in Peter the Great Bay. The Khasansky part of the reserve protects the rare Shlippenbach rhododendron. Tilyakovsky Cove is located in the southern part of the reserve. The underwater world of the Dalnevostochny Morskoy Zapovednik (Far Eastern Marine Reserve), occupying 98 percent of the reserves territory, is truly spectacular. Peter the Great Bay is the most biologically productive part of the Sea of Japan and has the highest level of marine diversity of any sea in Russia. Through the clear blue-green water, one can spot schools of silver fish ebbing and flowing with the waves, transparent jellyfish floating in the current, and the glowing shapes of single-celled organisms rising in the water column. Each of the numerous stratums from the surface to about 20 meters below has its own conglomeration of plants and animals, whose lives are intimately intertwined. Below 20 meters, in the dark world where the suns rays never penetrate, diversity declines and the sand and silt covered sea floor is reminiscent of an underwater arctic desert. There are more than 2,000 species of marine invertebrates in Peter the Great Bay. Starfish (Asterias amurensis, Distolasterrias nipon) live on the upper layers of the sea floor, where they occur in a variety of forms and colors, from deep red to violet blue. Kamchatka crabs (Paralithodes camtschatica), Japanese sea cucumbers (Stichopus japonicus), Japanese scallops (Mizuhopecten yessoensis), prickly sea urchins (Strongylocentrotus nudus, S. intermedius) and brightly colored sea anemones (Actiniae) are also found here. Colonies of Grays mussel (Crenomytilus grayanus) hold fast to rocks free of algae from about 1.5 to 15 meters below sea level. Numerous tiny invertebrates make their homes in and among the mussels. Sponges (Spongia, Bryozoa), Hydrozoa, and ascidians (Halocynthis roretzi, H. durantium) cling to mussel shells. Ascidians are fascinating underwater organisms. Their reddish-orange sack-like bodies have two openings for filtering plankton out of the water. The high concentration of vanadium in their blood &emdash; giving it a green color &emdash; helps the organisms oxygenate their blood. Mussels, which are highly productive throughout their extended lifetimes of 100 years or more, are an important food source for many underwater organisms such as fish, starfish, seals, marine birds, and others. Giant octopuses (Octopus dofleini) camouflage themselves by changing colors to match the rocks and boulders on the sea floor. They prefer waters where salinity is less than 30 percent. When disturbed, they eject an ink-like spew and change colors, quickly darting to a new hideout. Octopuses feed on mollusks, bottom-dwelling fish, and crabs, catching them with the suction cups on their arms. In turn, octopuses are hunted by sharks and seals, which migrate to the waters from the south. Near river and stream estuaries, where salty seawater is diluted by freshwater, commercially valuable giant oysters (Crasostrea gigas or Ostrea laperousi) adhere to rocky surfaces. Oysters feed mostly on plankton and diatoms (Chrisophita), which they filter out of the water. Arctic species of fish dominate the reserves water in wintertime, including Pacific cod (Gadus macrocephalus), navaga (Eleginus gracilis), halibut (Atheresthes reinhardtius), and tiny capelin (Mallotus villosus). Three-striped and white-edged rockfish (Sebastes trivittatus, S. taczanowski) are common inhabitants of the Sea of Japan. In the summer, the seas warm up and cold-water species retreat to the deep sea, and are replaced by over 100 warm-water species, such as pacific needle-fish (Strongylura anastomella). Exotic species like the hammerhead shark (Sphyrna zygaena), swordfish (Xiphias gladius), and flying fish (Exocoetus volitans) also appear on occasion. Benthic, or bottom-dwelling species, such as flounder (Kareius bicoloratus, Glyptocephalus stelleri), make up 60 percent of the 278 species of fish identified in Peter the Great Bay. Marine mammals in the bay include the common porpoise (Phocaenoides dalli) and common seal (Phoca vitulina). Whales and other mammals, such as the false killer whale (Pseudorca crassidens) and sea lion (Eumetopias jubatus), migrate into the waters occasionally. Breeding and haul-out areas for Larga seal (Phoca largha) are protected on islands in the reserve. More than 360 species of birds are found in the terrestrial areas of the reserve, which occupies only two percent of its area. Large bird colonies along the seashore are inhabited by cormorants (Phalacrocorax filamentosus, Ph. carbo, Ph. pelagicus), loons (Gavia arctica, G. stellata), thin- and thick-billed murres (Uria aale, U. lomvia), Atlantic puffins (Fratercula arctica), spectacled guillemot (Cepphus carbo), ancient murrelet (Synthliboramphus antiquus), and others. More than 40,000 birds nest in colonies on Furugelm Island alone. These birds fly south in the winter, and are replaced by birds that migrate here for the winter from more northern climates. The reserve protects the largest nesting colonies in the world for black-tailed gulls (Larus crassirostris) and Japanese cormorants. The shelduck (Tadorna cristrata) and Chinese egret (Egretta eulophotes) are two of the rare bird species that nest in the reserve. The handful of terrestrial mammals that inhabit the coastal islands of the reserve feed on marine mollusks, crustaceans, and small fish washed ashore by tidal waves. Only three rodents &emdash; forest mouse (Apodemus sylvaticus), field mouse (A. agrarius), and field vole (Microtus), and two carnivores &emdash; Siberian polecat (Mustela sibirica) and raccoon dog (Nyctereutes procynooides) &emdash; are found on the islands of the reserve. Bats, non-poisonous snakes, toads, and lizards also inhabit the islands. Sika deer (Cervus nippon), fox (Vulpes vulpes), and wild cat (Felis euptilura) are sometimes seen on along the coast of the mainland territory of the reserve. Eight hundred species of algae have been identified in the rich waters of the zapovednik. Vegetative zones are divided into narrow bands, or stratums, found at varying depths of the sea floor. Starting from the bottom, the first abundantly populated stratum runs from about 15-17 meters below sea level. Here, large, fan-like brown algae (Costaria coastat) sway in cold currents, clinging to underwater boulders. Agarum cribposum grows on smaller rocks. The most biologically rich stratum is from 5-7 meters below sea level. The vegetative zones become narrower as they approach the surface. Green sea lettuce (Ulva) and edible sea kelp (Laminaria saccharina), rich in iodine and bromine, are the most abundant plant species here. Algal mats are home to fish larvae, hermit crabs (Dardanu), and crawling mollusks. Rocky areas of the sea floor are covered with sea grass (Phyllospadix), which has thick roots and long narrow green leaves. Terrestrial habitats on the reserves islands are similar to floral communities in other parts of the southern Russian Far East. Forests grow along the lower slopes and plateaus of the islands. Broadleaf species including Amur cork tree (Phellodendron amurense) and Mongolian oak (Quercus mongolica) are mixed with coniferous rare Japanese yew (Taxus cucpidata) and Japanese red pine (Pinus densiflora). Vines (Vitis amurensis, Actinidia arguta) are laced among tree trunks. Near the shore, trees are small and grow in densely packed stands, often resembling thick shrubs. Farther inland, trees are taller. Under the canopy rare Shlippenbachs rhododendron (Rhododendron sclippenbachii) sprouts on the forest floor. Open areas are overgrown with grasses and flowers, such as short-stemmed sedge (Carex humilis), tiger lilies (Lilium lancifolium), dropwort (Filipendula), and bedstraw (Galium). In all, 900 species of terrestrial plants are found in the zapovednik. The Dalnevostochny Morskoy Zapovednik is located in the extreme southern part of the Russian Far East, near the border with North Korea. 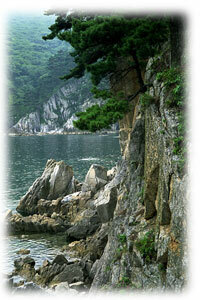 The reserve protects aquatic habitats, islands, and areas of coastline of the Peter the Great Bay, in the Sea of Japan. Covering 64,316 ha (643 km2), the reserve protects about 10 percent of the bay. Eleven islands are protected in the reserve. The territory of the reserve is located at the convergence of large faults in the Earths crust where the ocean floor recedes under the continental plate. The Sikhote-Alin Range, formed as a result of the uplifting of the Earths crust, descends steeply into the Sea of Japan. The southern spurs of the ridge, partly under water, formed large islands &emdash; Great Pelis, Furugelm, and Stenin &emdash; now protected in the reserve. The reserves shoreline is rocky and punctuated by a number of bays, small coves, and harbors. The average depth of the water in the reserve is not more than 20 meters, although the depth extends to 50 meters in some of the eastern sections of the reserve. Tidal processes engulf parts of the coastline twice a day, even though the difference between low and high tide is less than 50 cm. In summertime, water levels rise more due to monsoon winds. The unique, biologically-rich sea environment is partly explained by the climatic conditions. The reserve is located at the meeting point of warm and cold maritime currents. The terrestrial part of the reserve is located in the Temperate Zone, at the convergence of warm monsoon climate patterns and cold masses of northern air. The mean annual air temperature is 4.8o C. Average temperatures drop to &emdash; 11o C in January and rise to 21o C in August. Average annual precipitation is 800 mm, most of which falls during the late summer monsoon season. The weather in summertime is warm, but generally cloudy and foggy, and winters are cold for this latitude. The reserve is divided into four sections. The eastern section includes the islands and aquatic area around the Rimsky-Korsakov Archipelago. Here, the area of protected aquatic habitat is 45,000 ha (450 km2) and islands cover 900 ha (9 km2). The western section of the zapovednik protects 3,000 ha (30 km2) of aquatic habitat in the northern part of the Posyet Bay. The southern section of the reserve is located in the south of Posyet Bay, off Furugelm Island, where 15,000 ha (150 km2) of aquatic habitat are protected along with 200 ha (2 km2) of island habitat. The northern part of the reserve, 216 ha (2 km2) on Popov Island, is open to environmental tourism. The Dalnevostochny Morskoy Zapovednik was established in March 1978 under the Far Eastern Branch of the USSR Academy of Sciences, and made a division of the Institute for Marine Biology. The reserve was created as the only marine zapovednik at the time, to protect the unique natural ecosystems of Peter the Great Bay and the diverse flora and fauna of the bays littoral islands. The eastern section of the zapovednik is completely off limits to human disturbance, while scientific research of marine and island habitats is permitted in the western and southern sections of the reserve. Scientists study pectens (Patinopecten yessoensis) and giant oysters, among other species in Posyet Bay, and carry out experimental studies on the impacts of marine fishing and trawling on natural communities. A buffer zone, extending for three nautical miles in the water and 500 meters on land, surrounds each of the sections of the reserve. Fishing, hunting, and collection of plants are prohibited in the aquatic and coastal buffer zones. Shipping routes are strictly limited in the areas as well. The northern section of the reserve has been set aside for educational purposes. The environmental education center, restored with funding from WWF and the US Agency for International Development, is located at the reserve headquarters on Popov Island, 25 km southwest of Vladivostok. The center has permanent displays dedicated to marine flora and fauna, as well as a botanical garden. A system of tourist routes has been developed in the reserve and surrounding waters to demonstrate the unique beauty of the marine and island habitats. Davydov, M. and V Koshevaya. Nature Reserves in the USSR. Progress Publishers. Moscow, 1989. Sokolov, V.E. and E.E. Syroechkovsky, eds. Zapovedniks of Russia: The Russian Far East. Mysl Publishers. Moscow, 1985. Russia. Logata Publishers. Mosow, 1998.